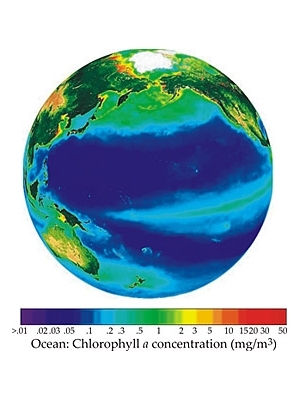 Researchers at the Massachusetts Institute of Technology in Cambridge, Massachusetts and at the National Oceanic and Atmospheric Administration’s Geophysical Fluid Dynamics Laboratory in Princeton, New Jersey discovered a correlation between the color of ocean water and the paths taken by hurricanes and other oceanographic weather systems. According to their study, more hurricanes form in greener waters where the sunlight is absorbed at shallower depths than in clearer waters. The color of the water in any given body of water is determined by a variety of factors. A primary factor is whether sediment, plankton, and algae tend to form or congregate near the surface of the water. When these elements are present in the water, it tends to turn the water green. The higher the concentrations of such biological material, the darker and greener the water gets. Increased amounts of these organisms also increases the rate that sunlight is absorbed by the water, meaning that the greener the water, the shallower the point where sunlight fails to penetrate into the water. The MIT and NOAA research shows that the depth where sunlight is absorbed into the ocean waters is a key factor in determining the likelihood of hurricane formation and how hurricanes travel once formed. More specifically, the depth of sunlight absorption is important in determining how water circulates through the ocean, which in turn plays a large role in how heat is distributed throughout the world’s waterways. Shallower absorption points mean cooler water which lowers the incidence of tropical storms. The researchers confirmed this by modeling a system where the protoplankton in large portions of the northern Pacific were depleted. Sea temperatures dropped in the region and hurricane incidence dropped by 70% in the subtropic regions. At the same time, hurricane incidence increased by 20% in the warmer areas nearest the equator. In all models, the majority of storms formed wherever the water was warmest. Scientists involved in the project point out that there is a great deal they still do not understand about oceans, ocean physics, and how storms are formed. Because of that, the parameters used in this study may not be realistic and may not accurately depict real storm behavior. Still, it highlights the fact that oceans are complex systems with many factors that can affect water behaviors in unexpected ways. relying on the temperature differences between deep water and surface waters, a video discussing the discovery of the hottest water on Earth, and a video covering the destructive power of hurricanes. Read more about the role of ocean color in hurricane formation and motion in this MIT press release or this article on the NOAA website. You can also read the original paper (PDF) outlining these findings on the NOAA website.